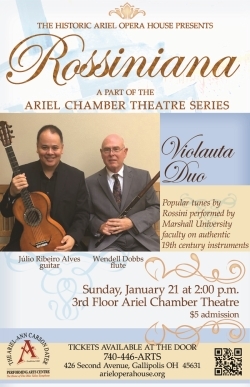 The historic Ariel Opera House is please to welcome Marshall University faculty members Dr. Júlio Ribeiro Alves, guitarist, and Dr. Wendell Dobbs, flutist who form Violauta Duo. This program features popular tunes by Rossiniana and will be performed on authentic 19th century instruments. Tickets are $10 and available at the Chamber Theatre door on performance day.